Lakkoi, commonly spelled Lakki on road signs and maps, is a village on Crete in the foothills of the Lefka Ori (White Mountains). 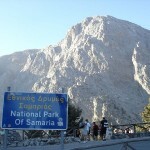 The village is situated on the road between Chania and the plateau of Omalos which leads to the Samaria Gorge. Lakkoi is situated at the height of 450 metres, below the White Mountains which rise another 1,000 metres to the south. 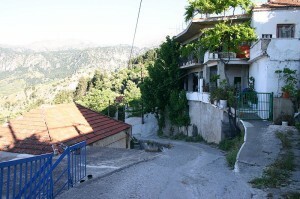 Most of the houses cling to steep slopes covered in olive and chestnut trees, reached through narrow roads or tracks that run down from the main square. Traditionally the villagers have cultivated olives and raised goats, sheep and chickens. With limited work opportunities, the population has declined from a peak of around 2,000 to about 400 today. There are signs of growth as houses are being purchased and renovated by citizens of other European Union countries seeking low-cost retirement or vacation homes. The climate is cool in winter, with occasional snow, wet in spring, hot and dry in the summer. After the Ottoman conquest of Crete, the people of Lakkoi were involved in periodic revolts, notably the revolt of 1821-1828 during the Greek War of Independence, where an Ottoman army of 5,000 men led by Latif Pasha of Chania was routed in a pitched battle at Lakkoi. In the great rebellion of 1866-1869 Katerina Stamataki of Lakkoi was a distinguished woman revolutionary. During the Battle of Crete in May 1941 and the days that followed, 485 men and women resisted the German occupiers, and 68 Lakkoiotes lost their lives in the fight for the freedom of Greece. Moni Gonia Monastery, Monastery of Our Lady of Gonia or Monastery of Panaghia Odigitria is an orthodox monastery located 1 km north of Kolymvari and some 26 km from Chania, on the coast of the south-east Rodopos peninsula in Crete, Greece, overlooking the Gulf of Chania. Today dedicated to the Assumption of the Virgin, celebrated on August 15, the monastery was originally founded in the 9th century and was dedicated to Aghios Georghios (St. George). It was originally situated at Menies on the ruins of the ancient temple of Artemis Britomartis (Diktynna). The monastery was built in the 13th century adjacent to a cemetery, but it was rebuilt between 1618 and 1634 in its present location, with Venetian influences in its architectural design and adornment. The distinctive fountain in front of the monastery’s entrance was built in 1708 and the belfry in 1849. Today, the monastery contains numerous Byzantine artifacts from the 15th and 17th century including Cretan icons by Parfenios, Ritzos, and Neilos. It also has numerous relics and other rare religious treasures from the Byzantine period and ancient inscriptions on the walls. 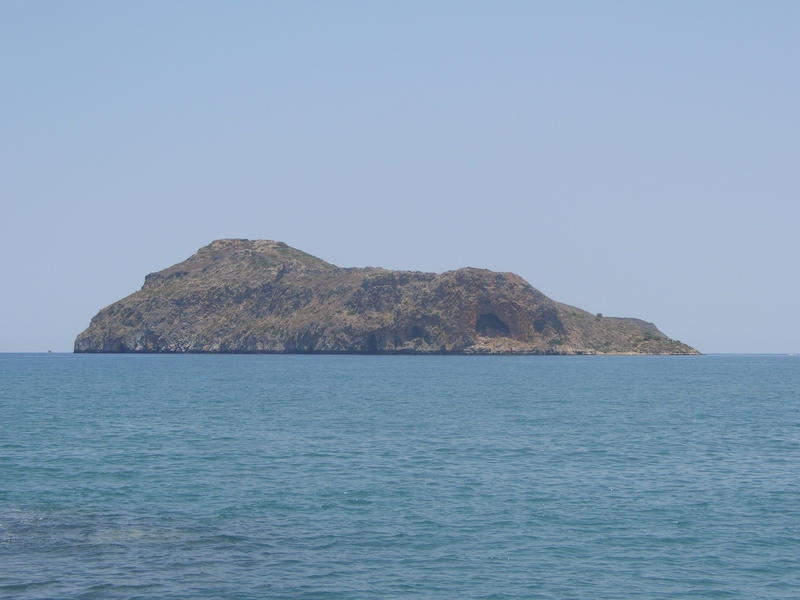 Agioi Theodoroi are two uninhabited islets off the coast of western Crete. One is named Agios Theodoros, also called Thodorou, and the islet a few metres further north is called Mikros Agios Theodoros (“Little Agios Theodoros”). 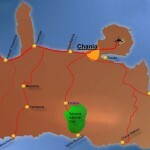 They are part of the municipality of Agia Marina, in Chania Prefecture. Kri-kri inhabit Aghios Theodoros. 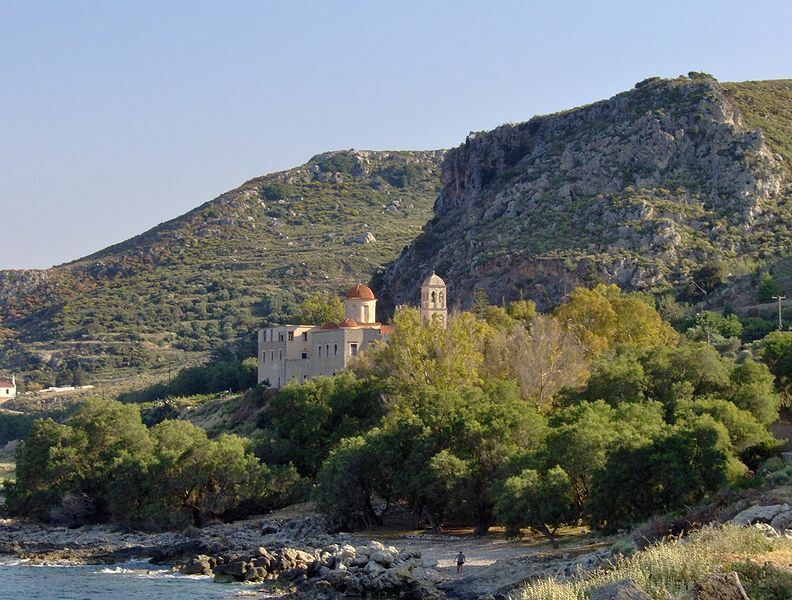 In 1930 the municipality of Agia Marina with the cooperation of the hunting association of Chania decided to make the islands a nature reserve. It was in 1935 that Theodoros Viglis caught one male and two female Kri-kri in Samariá Gorge and released them on Agios Theodoros so that they could breed with integrity since no other goats inhabited the island. This initial small community of Kri-kri was too small to prevent inbreeding and more Kri-kri were introduced to the community. 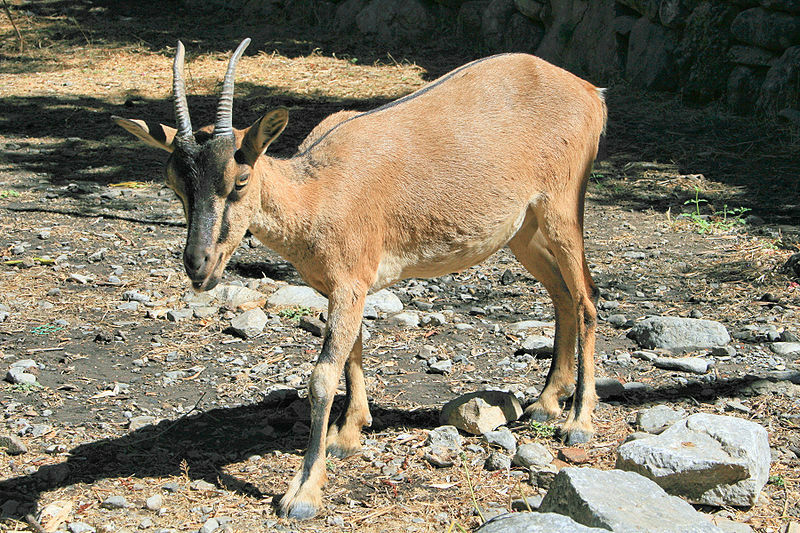 The isolated community of Kri-kri at Agios Theodoros has been used to provide Kri-kri to zoos around the world. Nearly 20 hectares of land are waiting to welcome you, full of fruit trees from all over the world, herbs, medicinal and ornamental plants in a park different from others, where the land’s formation and the region’s microclimate make it a paradise for hundreds of plants and animals. 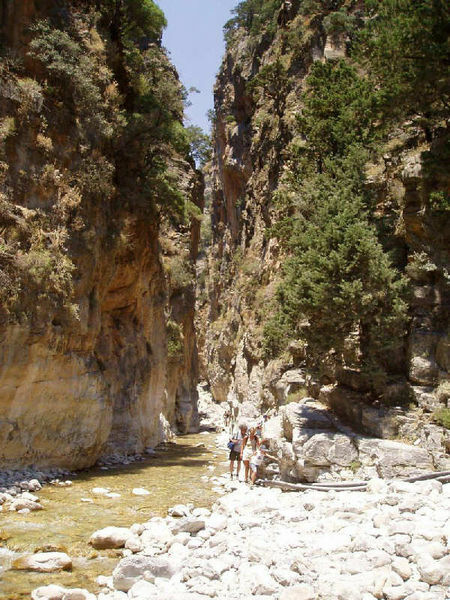 Hiking in Samariá Gorge: Samariá Gorge is a National Park – a major tourist attraction of Crete – and a World’s Biosphere Reserve. The gorge was created by a small river running between the White Mountains (Lefká Óri) and Mt. 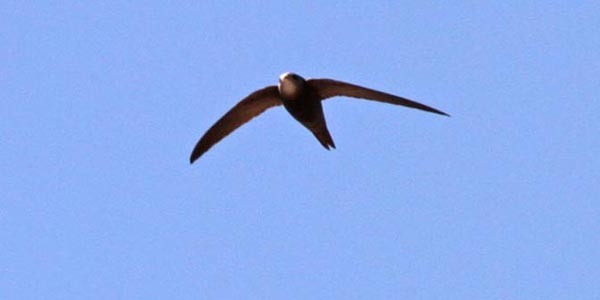 Volakias. There are a number of other gorges in the White Mountains. 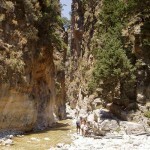 The gorge is 16 km long, starting at an altitude of 1,250 m at the northern entrance, and ending at the shores of the Libyan Sea in Agia Roumeli. 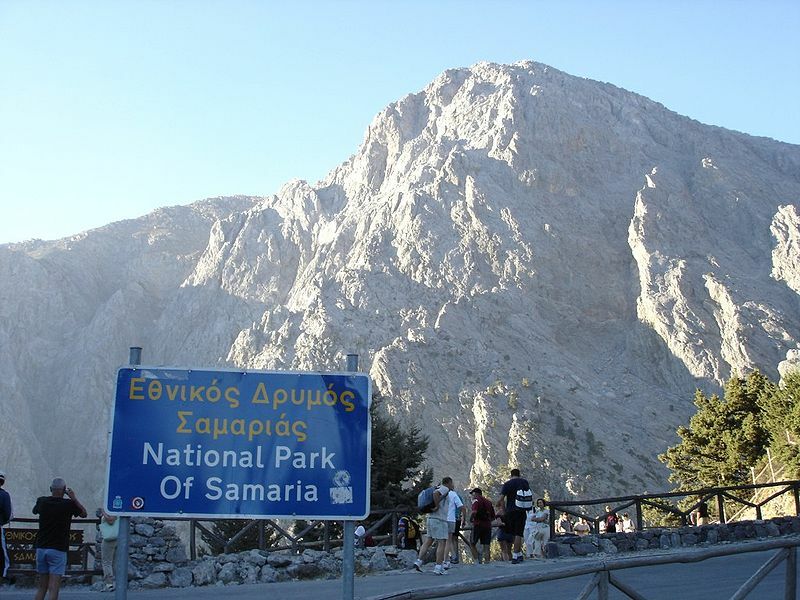 The walk through Samaria National Park is 13 km long, but you have to walk another three km to Agia Roumeli from the park exit, making the hike 16 km. The most famous part of the gorge is the stretch known as the Iron Gates, where the sides of the gorge close in to a width of only four meters and soar up to a height of 1,100m. 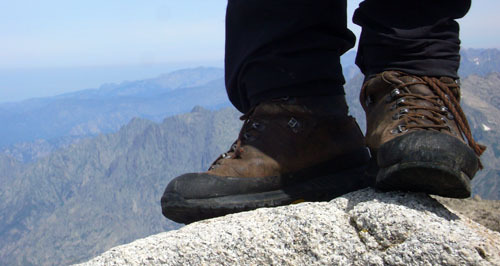 Visits to the National park are allowed from May 1 to October 15. Park visiting hours are 07:00 to 15:00 daily. 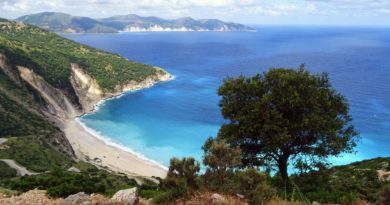 From 15:00 to sunset, visitors are allowed to walk a distance of only two km within the park, either from Xyloskalo or from Agia Roumeli. 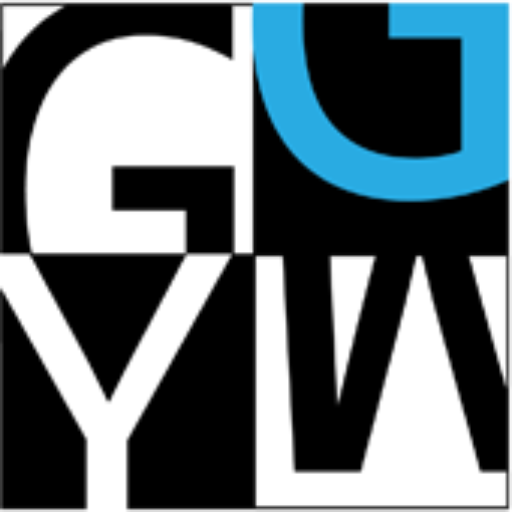 Within the park it is strictly prohibited to camp, stay overnight, light fires, or swim in the streams of the gorge. Daily buses from Chania to the head of the gorge, called Xyloskalo. The buses, marked “OMALOS”, depart Chania Central Bus Station at 08:30; the fare for a round trip is €14.40 (2011). The entrance fee is €5 (no reduced price for children or students, 2011). There is plenty of drinking water all along the gorge. 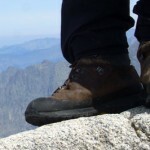 Sneakers or hiking boots are recommended. At the end of the gorge plus 3.2 km is Agia Roumeli, a village with restaurants and accommodation, and boats to Chora Sfakion or Sougia. To return the same day, take the 17:00 boat (fare: €9.00, 2011) to Chora Sfakion. From Chora Sfakion, buses return to Chania, departing at 18:30; the bus always waits for the boat to arrive. 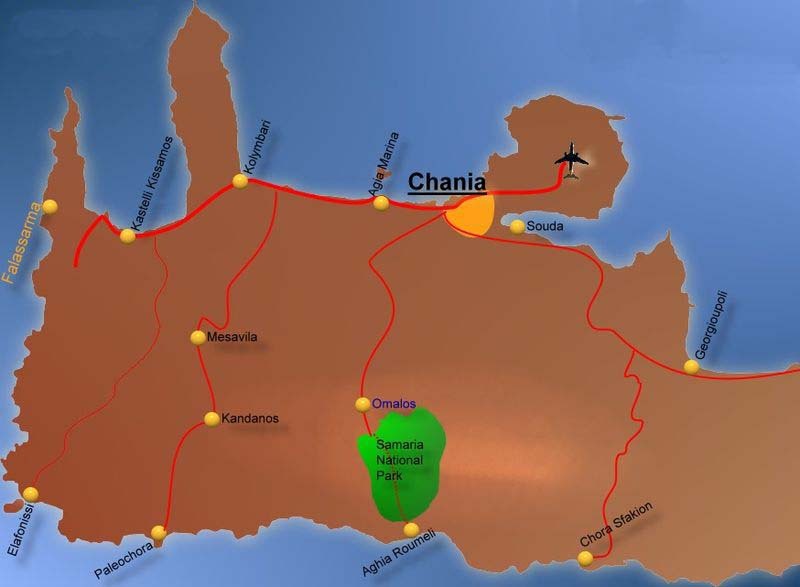 Tickets for the two buses can be reserved at the ticket office at the Chania bus station. The ticket for the boat can be purchased in Agia Roumeli only. 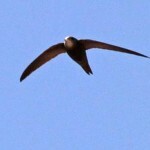 Birdwatching in the White Mountains (Lefka Ori): A rugged mountainous area of Crete. The northern area of the site is dominated by maquis, the south by conifer forests. The main human activities are hunting, livestock-farming and tourism. This is an important site for breeding and passage raptors, and for species characteristic of scrub and montane habitats.